In order to evaluate roots’ repartition along soil’s profile and characterise plants’ root by measuring functional traits, we used a hydraulic core drilling machines which allowed collecting root and soil by layer of twenty centimetres high and reach a depth of one meter. Advantages of this method are the reduction of soil compaction in comparison of the sampling of one meter long soil core. To collect each twenty centimetres soil core we use a core drilling divided in two independent parts which allowed us to extract the soil core without disturbance of the root system or the soil structure. For separate roots from soil without disturb root structure we use a method derived from the elutriation method. We put soil core in warm water which is agitated with compressed air, the box containing the water was filed with sieve to allowed the root collection. After ten minutes of elutriation we collect roots free of the major part of their soil. The rest of the undesirable particles must be removed by hand. Small pots do not allow a « natural » root system development particularly in depth, which results in the plant becoming potbound. 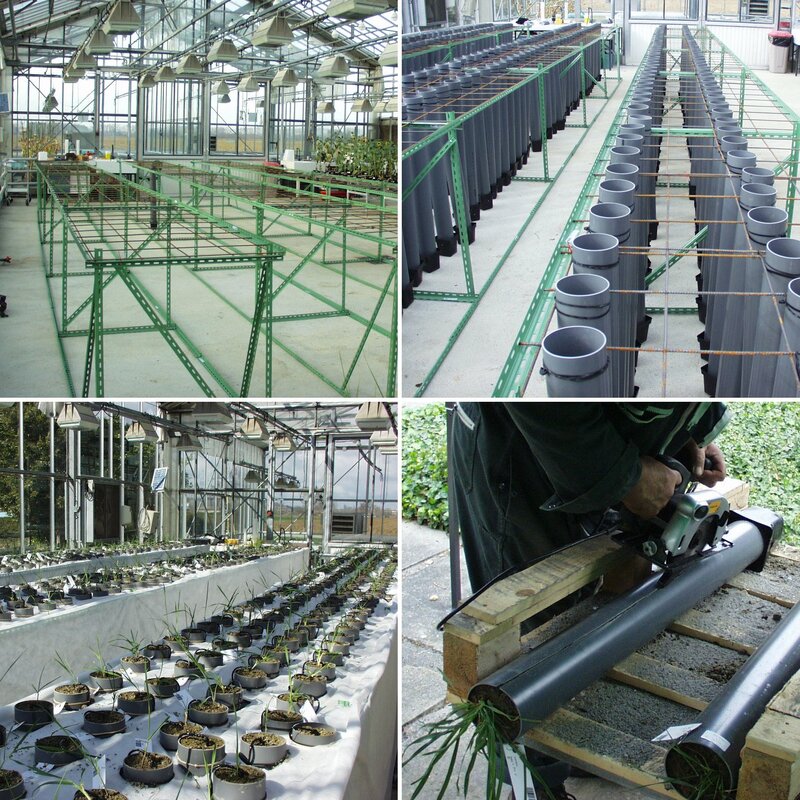 In order to go-over these problems we chose to grow plants in mesocosm made made from PVC cylinders (1m deep). This mesocosm allow much deeper rooting and can prolong the experimental period before a plant becomes potbound. We grown grassland species (grasses and légumes) more than 100 days in this system. Successive stages of mesocosm experiment : Top-left, the structure supporting the pots during all the experiment; Top-right, PVC pots were closed by perfored PVC pots to allows drainage; Bottom-left, all the structures were covered with white trap in order to protect pots from sunlight to limit the increase of soil temperature; Bottom-right, a way to open the pots. For the image analysis we used two software Fiji, Winrhizo. Winrhizo (Régent 2007) is a commercial software allowing the automatic measurement of different parameters on the studied sample, it provide mean root diameter of the sample, the total length, the total surface, the total volume and the repartition of length, surface and volume in previously specified diameter classes. This software also allowed the measurement of architectural and fractal parameters (for these to kinds of parameters intact root systems are needed). Winrhizo also allowed measurement based on colour levels, this kind of analyse allowed to asses the percentage of the sample touched by a disease or coloured by a particular treatment. 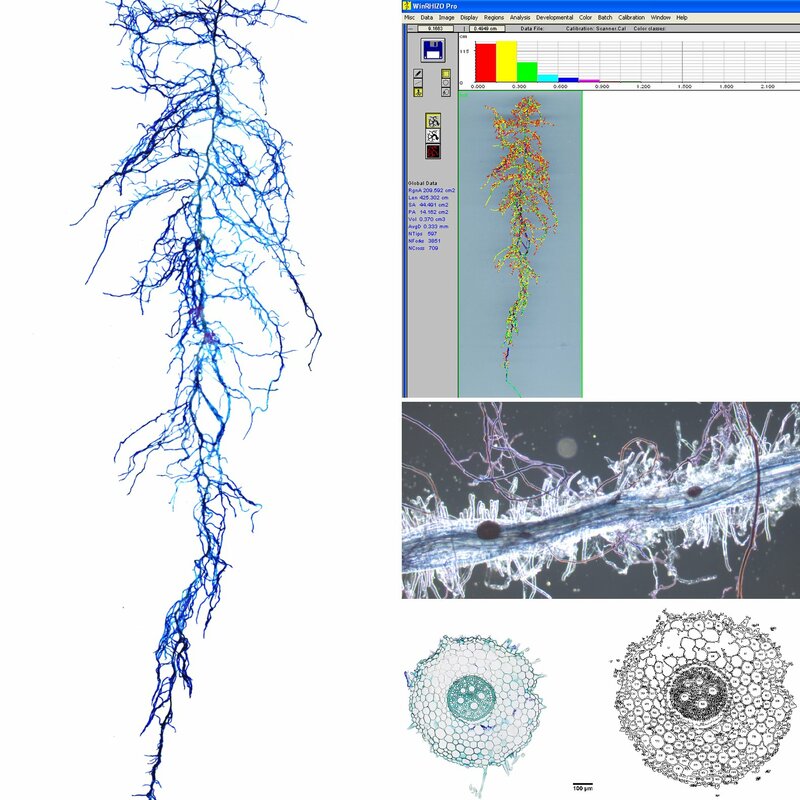 Fiji (Imagej) is a free software allowing non-automatic measurement, for example the root hairs length on previously scanned roots. Using the particle analysis process it allowed also to count object like cells or vessels and measure their area. These analysis may be empowered using free plugins developed for this program.